This template was created so you can have the best game plan when going into Black Friday. It can be used for new or seasoned Black Friday shoppers. Column A has your date/time. Be sure to enter AM or PM so that when you filter you have the most accurate information. Column B has the Store in which you will be attending to purchase your item. 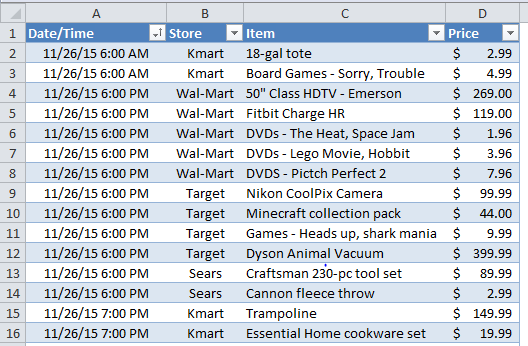 The Item to be purchased can be found in Column C.
The Price to the corresponding item is in Column D.
There are some examples in the template to show you exactly how it works. In order to add more rows than what the table shows, simply hit tab in the last cell (currently D37) to add another row to the table. 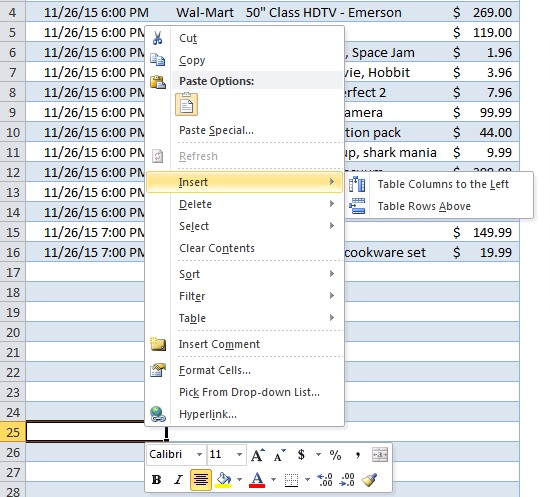 You can also right click in the table and select insert, Table Rows Above. The best part about this table is that you can filter on Date/Time to see where you should start based on what time a store opens. You can also sort on Store, Item and Price depending on what you would like your plan of attack to be. There is a Total at the bottom of the table that will show you approximately how much you would spend if you bought the items on your list (this doesn’t factor in tax information). If you would rather not see the total you are more than welcome to delete this row. Good luck and have a safe and enjoyable shopping experience!